In the United States, critical congenital heart defects affect about 4,800 newborns each year. Babies born with a critical congenital heart defect are at significant risk for death or disability if they are not diagnosed and treated soon after birth. But some babies may appear healthy at first and can be sent home with their families before the defect is detected. It has been estimated that at least 280 infants with an unrecognized critical congenital heart defect are discharged each year from newborn nurseries in the United States. These babies are at risk for having serious complications within the first few days or weeks of life and often require emergency care. Critical congenital heart defects can be detected in some babies using pulse oximetry screening. Pulse oximetry screening can identify some infants before they show signs. OHSU Doernbecher began pulse oximetry screening for all newborns in our Mother-Baby Unit in January 2012. Once identified, these babies can be seen by an OHSU Doernbecher pediatric cardiologist and receive specialized care and treatment. Pulse oximetry is a simple, painless test that is done at the bedside using a machine called a pulse oximeter. 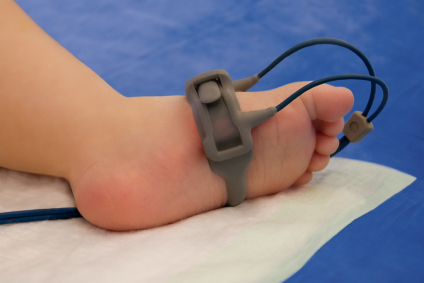 A sensor is placed on the baby’s foot to measure the amount of oxygen in a baby’s blood. Low levels of oxygen can be a sign of a critical congenital heart defect. Pulse oximetry screening is done when a baby is 24- to 48-hours old. Pulse oximetry screening does not replace a complete history and physical examination, which sometimes can detect a critical congenital heart defect before the development of low levels of oxygen in the blood; pulse oximetry screening complements the physical examination. If the results are “passing,” it means the baby showed no signs of a critical congenital heart defect. This type of screening test does not detect all critical congenital heart defects, so it is possible to still have a defect despite a negative screening result. If the results are “failing,” it means the baby’s test results showed low levels of oxygen in the blood. A failing test does not always mean that the baby has a critical congenital heart defect; rather, it means that more testing is needed. The baby’s pediatrician might recommend the infant be screened again or have more specific tests, like an echocardiogram, an ultrasound picture of the heart, to diagnose a critical congenital heart defects.